With a month to plan, I kept on opening single vineyard wines. Even when a nasty cold kept me from tasting anything but Red fruit? Wine? I kept opening them and had some yummy things from yummy places like Saralee's and Stagecoach. But the one I loved the most is one that if I had gotten a current vintage, I could have snuck in under the guidelines since it is made from fruit from three vineyards within the Santa lucia Highlands AVA: Doctors Vineyard, Hahn Estates, Santa Lucia Highlands fruit. 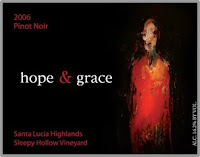 But I found tucked away an 2004 the awesome folks at hope & grace had made from a single vineyard; Robert Talbott’s renowned Sleepy Hollow Vineyard in the Santa Lucia Highlands. the 2004 is made from fruit sourced from a small 3 acre parcel within block” A” of the Sleepy Hollow Ranch. Warm sun, cooling fog, long growing season make this a great area for Pinot Noir. The Santa Lucia Highlands consistently produces wonderful wines form wonderful producers. Weather, geography and love of the land combine It's a very special place as you can see here. But if you get a chance, so see for yourself. 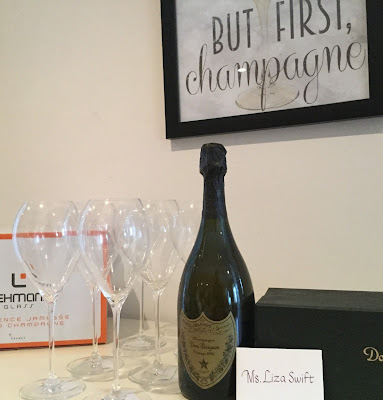 Looking forward to our Santa Lucia retreat. In the meantime, I should probably sneak on up to the tasting room in Yountville.